So You’ve Got a Mobile Commerce Website, Now What? Many retailers have launched a mobile strategy starting with a mobile optimized website, and for many, the big question is “Now What?”. That is the exact question Craig Shields, VP of eCommerce at Jewlery Television (JTV) and I answered during our live webinar on Thursday, entitled “So You’ve Got a Mobile Commerce Site, Now What?”. I’ve provided a recap of the main points we discussed along with the slides from the session below. So You’ve Got a Mobile Commerce Website. Now What? One of the main points we discussed is how multichannel has evolved beyond a series of “channels” and into a variety of digital touch points that consumers interact with, including traditional ecommerce sites, smartphones, tablets, mobile point of sale, social networks and others. Consumers are making decisions non-linearly, interacting with a variety of these digital touch points along the way. Consequently, it’s important brands ensure a consistent, engaging experience across these touchpoints. Mobile is playing a leading role in this new age of multichannel commerce. While many retailers still have not launched a mobile commerce strategy (about 26% according a recent Forrester study), many others have at least started to plan. Regardless, whether retailers have already implemented a mobile strategy or are starting to plan a strategy, the starting point is usually the mobile web, mainly because most retailers already have a traditional ecommerce website and it makes sense to optimize the site to reach the broadest set of consumers on mobile devices. In the past, we’ve discussed why mobile commerce starts with the mobile web. Given that mobile is leading the way in the multichannel, multi-touchpoint world and the mobile web is typically the starting point, the question is: where do retailers go from here? 1. Know what to measure. Start measuring how your mobile website is performing, if you’re not doing so already. Make sure you also plan out your measurement strategy in advance to track key performance indicators (KPIs) across other “sub-channels” of mobile you may pursue, such as native apps. This will allow you to spot opportuntiies and prioritize resources. Key mobile KPIs JTV measures are: sales, unique visitors, average order value, converstion rate, and time on site. They also track KPIs unique to native apps, such as cumulative installs and active installs. 2. Continue to invest in the mobile web. You’ve already got a mobile website, and should continue to invest in it, as its going to be the most important part of your mobile strategy. Make sure your site has “core” functionality expected in every mobile website, as well as “enhanced” functionality that your consumers are looking for. JTV introduced product reviews after the initial launch of their mobile website, and a saw a 35% increase in conversion rate– a pretty significant lift. 3. Enrich the mobile experience: go native. Mobile devices put a lot of funtionality into the hands of consumers– functionality that can greatly enrich the shopping experience. Retailers should seek to exploit this functionality by tapping the native capabilities of the device. The primary way of getting there today is by mobile native apps, but hybrid apps are increasingly becoming an option. JTV offers a richer shopping experience on their native app than they can on their mobile website, including live broadcast video, a ring sizer, and “Gemopedia”, an educational guide on gemstones for consumers. 4. Engage mobile consumers. It’s important not to take a “build it and they will come” approach, but rather view mobile as its own true channel, utilizing mobile-specific features to engage mobile users to drive mobile adoption, usage and ultimately sales. We shared several examples of how to do this, including JTV’s use of mobile alerts and campaigns, on-air ads and promotion through Get JTV Your Way. 5. Look beyond the smartphone: tablets. Tablets are increasingly becoming adopted by consumers and should be considered a key part of evolving a mobile commerce strategy. JTV has seen a large amount of traffic from the iPad, and has introduced features that would appeal to iPad consumers, and has also placed a tablet specific mobile site and iPad native app as part of their mobile roadmap. 6. Create a richer in-store experience. Mobile bridges the gap between the physical world and online, serving as a way for users t interact with the brand while physically in the store. Consumers love in-store technology to help with information and overall experience– from barcode scanning for price comparing and reasearch purposes to gift cards and loyalty rewards and mobile payments. We discussed a variety of mobile technologies that are emerging in-store, including QR codes, mobile point of sale (mPOS), NFC-enabled mobile payments, iPad clienteling, tablet kiosks, augmented reality and location based services. 7. Think outside the (set top) box: internet TV. With the proliferation and consumer adoption of connected TV devices, including internet TV as part of multichannel strategy makes sense, particularly as internet TV increasingly are designed to interact with other devices such as smartphones and tablets, rather than being perceived as standalone devices like laptops. For JTV, internet TV presents a unique opportunity to interact with their consumers, offering an opportunity to extend shopping directly into the living room. They’ve created a Roku channel, and are considering AppleTV and GoogleTV channels, including possible companion apps and building in ecommerce functionality. Facebook represents an opportunity for retailers to build brand awareness, increase customer loyalty, improve getting found online, and drive in-store traffic. All of these activities ultimately help drive online revenue, mainly when retailers can successfully aggregate Facebook’s data with consumer data from their ecommerce environment in interesting and compelling ways. Facebook provides tools to help enable this, such as Facebook Connect, which retailers can leverage to make the “onsite” experience a much richer one. The “on Facebook” experience is also an important one for most brands. Retailers have mainly used fan pages to connect with consumers, incorporating creative ways to drive deeper brand loyalty. Recently, setting up storefronts on Facebook has become another way to engage consumers, and one that potentially could drive additional online revenue. A Facebook Store should be one part of a larger Facebook strategy, not the end game. Retailers need to think about a larger Facebook strategy, one that will reach consumers both on-Facebook, but more importantly, “off Facebook” or on the retailer’s site. 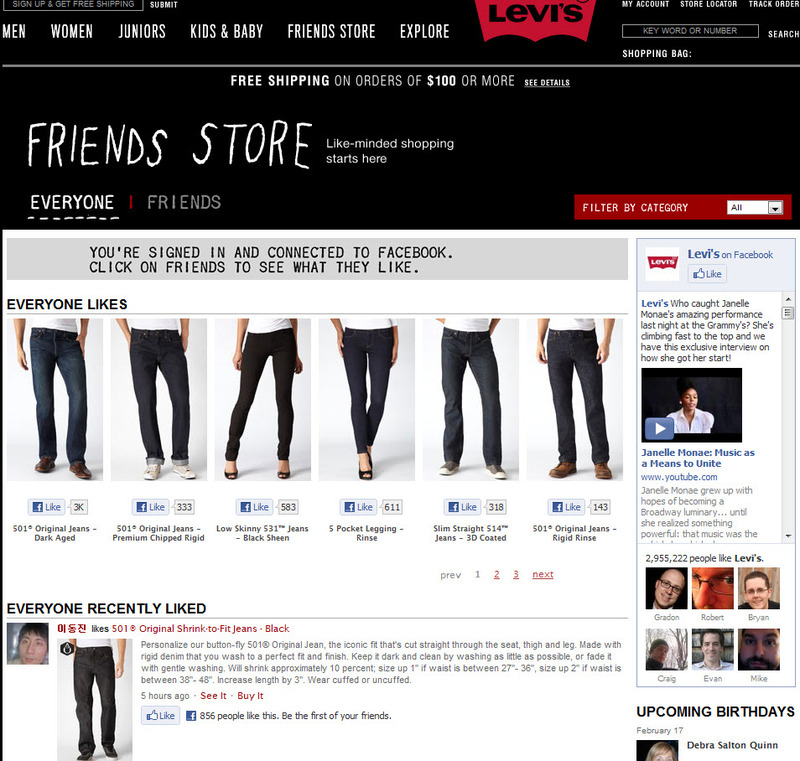 In fact, Facebook itself views storefronts as “one small piece” of the larger, burgeoning opportunity of social commerce. The real opportunity is the integration of Facebook into the ecommerce site. Facebook is also increasingly providing ways for retailers to reach consumers in-store, such as with Facebook Deals, which should also be part of a larger Facebook strategy. Integrate the Facebook Store as part of the brand’s main presence on Facebook. For most retailers, a fan page is the main presence in Facebook. Integrate the Store as part of fan page to take advantage of the critical mass of fans and activity that already exist there. Good examples of this are the 1800 Flowers and JC Penny, both of whom have made their Facebook Stores part of their main fan page. Apply ecommerce best practices without trying to re-create your ecommerce site entirely in Facebook. Facebook is not an ecommerce platform, so trying to replicate the shopping experience you’ve created on your website (or replace your existing website) should not be an end goal. Nonetheless, the Facebook storefront should be viewed as an extension of your brand, where ecommerce best practices still apply. For example, ensuring details about the product, such as care instructions, and size charts, as well as an ability to select size, color and view dynamic product images all apply in Facebook. Use Facebook social data as part of the Facebook Store experience. If you’re building a store in Facebook, why not leverage Facebook social data to make the experience even more compelling? The social data could be part of the shopper’s social graph (to gain greater personalization) or outside of the shopper’s social graph (useful if the shopper’s social graph is not active in that particular Store). An example would include an in-page activity stream of all the Facebook users who have visited that brand’s Facebook Store, revealing info such as what they’ve purchased, put in their cart, liked, commented, etc.. 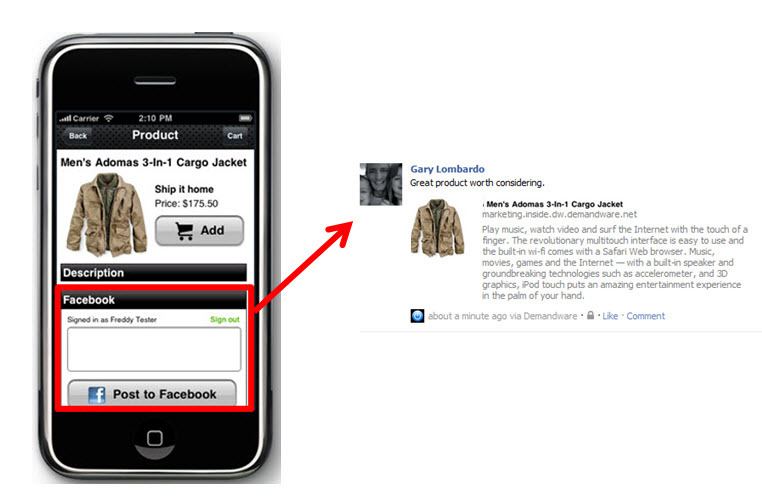 This would enrichen the shopping experience in the Facebook Store and increase the chances they would transact. Implementing a Facebook Store does not require a lot of time and resources. Most Facebook Stores can be up and running with little technical knowledge and a short amount of time. Since the cost of implementing a Facebook Store is so low and the revenue potential so immediate, the benefit of doing so outweighs the cost, thus making it a worthwhile investment. Be realistic about the amount of online revenue a Facebook Store will bring. View any revenue generated from a Facebook storefront as opportunitistic in the short-term. Setting up a Facebook Store is an unproven concept, so any revenue generated from the effort should be viewed as opportunistic in the short-term. Over time, more consumers may welcome the opportunity to transact through a Facebook Store, but until that time, a Facebook Store is largely a low-cost opportunity for incremental revenue. While overall online sales in the US is increasing, it’s doing so at a decreasing rate between 2010-15. Mobile and social driven ecommerce sales are doing so at an increasing rate in the same time period– evidence that mobile and social are fueling the overall growth. Social commerce will touch about 5% of all ecommerce sales in the US by 2015, while mobile commerce will drive almost 11%. In other words, about 16% of all retail ecommerce will come from mobile and social. Mobile commerce sales are growing at breath-taking pace (82.8%) from 2010-2011. 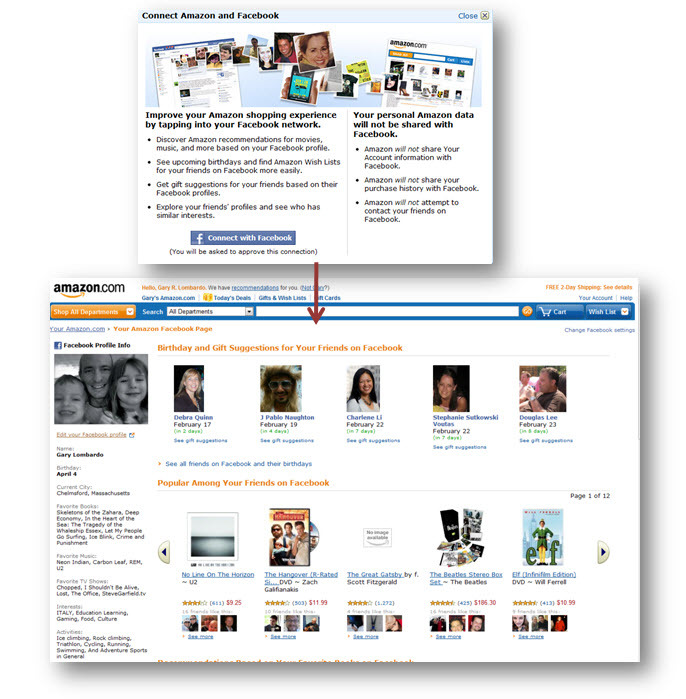 Social commerce sales are expected to grow two fold in the US between 2011-12. Social commerce is driving more online sales internationally than in the US today, but that is expected to change significantly in the next few years. If you’re a retailer, understanding macro market trends is important for planning your overall ecommerce strategy. Mobile and social commerce are clearly increasing in importance and are something to include as part of your investment strategy, particularly how it drives word of mouth transactions and in-store traffic. However, how much and how to approach investing will be determined by the specific trends within your own segment of ecommerce and to what extent your consumers are using mobile and social as part of how they shop. Take the time to understand these trends and consumer behavior while mapping out your social and mobile commerce strategy. Shopping is an inherently social activity, with consumers enjoying to share with the world great products they enjoy, deals they’ve found, among other activities. It’s a natural part of human behavior and one of the reasons why we’ve seen the a huge interest in using Facebook as a platform for shopping. Mobile devices make it even easier to be social while shopping by putting the devices capabilities directly in the hands of consumers and making it easier to do everything from creating videos to sharing experiences to Twitter and Facebook while shopping with mobile devices. The obvious benefit to Moodstocks is being able to just scan an object without relying on codes, which makes anyobject (in theory at least) become “socially enabled”. It’s informative to understand what others, especially your own social graph, has to say about a particular product using these apps, but it’s also important to tie in incentives to purchase. Stickybits does a good job of doing this, providing offers, as well as a gaming layer, that leads to greater rewards. Moodstocks is still early on in the process, but has plans to get there. Engage in the communities– Spend some time in these applications, particularly engaging community members who comment on your products or even your competitor products. Creating this level of engagement will demonstrate your brand is active and cares about feedback on your product. Provide offers within the communities– As the offer-based capabilities of these sites increase, experiment with providing offers. Just like Foursquare and Shopkick in the location-based shopping world, social apps such as these provide an additional channel to reach consumers and drive online and in-store transactions. Explore an integration– Most of these type of applications offer open APIs, so the possibility of leveraging the capabilties they offer in your own mobile strategy is possible. For instance, allow consumers to scan objects in your own shopping app to bring up product details pages or perhaps feed into an activity feed of consumers associated with your brand. Another option could be to allow for products to be shared directly from your product detail pages directly into the communities, and allow comments or reviews of the products to push back to your website and mobile app. These are just a few of the ways you could leverage these social shopping apps as a platform. How have you considered working with social shopping applications? A very interesting discussion on how innovations in multichannel– from kiosks to mobile devices to digital vending machines is changing the shopping experience. Learn how to take advantage of the social web to drive sales, connect with your target community, and build a loyal following. Mobile Payments: My Smartphone Just Bought My Beer! This session will focus on how technology and the industry are moving forward to make sure consumers will use their mobile devices for in-store and online purchases. A session focused on making the mobile web and mobile native apps accessible for all audiences- something online retailers should consider to reach all audiences. Targeted at developers, this session looks at an alternative approach to developing native apps for iPhone and iPad devices. This session will examine how companies can design a seamless experience from traditional web to mobile devices, which helps drive mobile commerce. Location based services are one of the most important emerging trends today for retailers and this session will look at how marketers can use social location marketing effectively as part of their campaigns, including optimizing for mobile. A session dedicated to designing for the tiny space on mobile device screens. This session will look at how mobile devices are driving consumer behavior and how the user experience is evolving. If you’re at the event, please be sure to say hi. Invest in a mobile optimized site. Mobile commerce starts with the mobile web, and if you haven’t optimized your website for mobile devices, you are not only missing an opportunity to drive online sales, but also the opportunity to grow competitively as a result as the nascent mobile commerce market matures. Adapt to what your consumers want in a mobile experience- Having a mobile site is ultimately about making it easier for consumers to transact, whether it be online or in-store. Understanding how consumers use your mobile site and making sure it reflects that experience will determine whether they transact or not. According to a recent survey by eMarketer, the top activities consumers performed using their smartphones in the 2010 holiday season included: finding a store location, research specific products, browse products, price compare products, look for discounted deals, and check product availability, among other activities. Are these the same preferences of your consumer? If so, does your mobile website reflect these capabilities? If not, consider incorporating them in time for the 2011 holiday season. Do something different- The retailers who experienced success in the 2010 holiday season with their mobile strategy were those who did something different to make mobile shopping more attractive to consumers and to make their brand stand out, such as Steve Madden’s use of gift cards and mobile coupons and JC Penny’s Christmas themed promotional offer featuring badges and coupons. Mobile commerce is a fantastic area of innovation and a great place for retailers to “WOW” consumers, raise awareness and further differentiation of your brand. The time is now to start thinking about what you could do differently in mobile commerce in the 2011 holiday season. Expand to other devices– While smartphones should remain the primary focus, especially as their penetration rate among total mobile device usage rises, retailers should consider other devices part of their strategy. Feature phone (or WAP) enabled sites will continue to be used by the majority of mobile users, so reaching that audience will remain important. Also, with the explosion of tabular devices recently (in addition to the iPad), optimizing a tabular-specific site will become important, especially for retailers who have a lot of web traffic coming from tabular devices and consumers that tend to shop from on their sofa, coffee shop or other places where tabular devices are likely to be used. 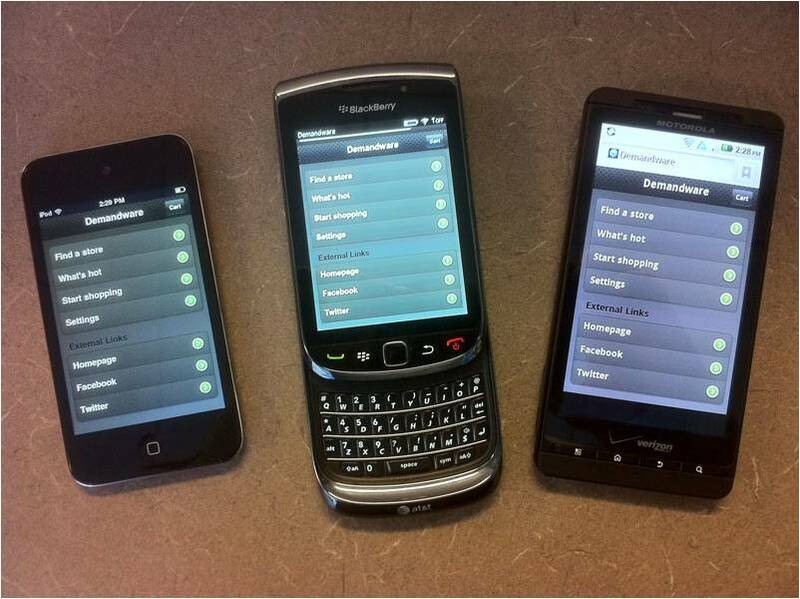 If you didn’t think beyond the smartphone in 2010 holiday season, do so in time for the 2011 holiday season. Ready your consumer base– While consumer adoption of mobile commerce is rising rapidly, many consumers still do not associate shopping with their phone. Even fewer probably realize that your brand offers a mobile shopping channel. Promote mobile shopping early in 2011 so that maximum awareness and adoption can be achieved in time for the holiday season. Promote it online with your traditional website (Target is a good example of this), social media (Twitter, Facebook page), online ads, as well as in-store, such as in-store signs and training associates. The 2011 holiday season will be the biggest yet for mobile online sales. Getting ready to capitalize on the opportunity should start today, beginning with the lessons learned from the 2010 holiday season. Facebook and it’s 500 million + users represents a large potential market for any company who sells online. The question for retailers is how to best reach this audience, and perhaps more importantly, how to use the vast amount of user social data in Facebook to enrichen the shopping experience on your site. Facebook Connect helps do both for retailers. Facebook Connect is the evolution of the Facebook platform that allows websites– including online ecommerce sites– to connect with a user’s Facebook identity, profile, friends, and overall social graph. One of the main objectives of online retailers is to get a shopper to voluntarily share their contact information and create an identity on the site and with the brand. This not only shows a higher committment level from that shopper to the retailer, but also gives the retailer an opportunity to actively reach out to the user in the future. 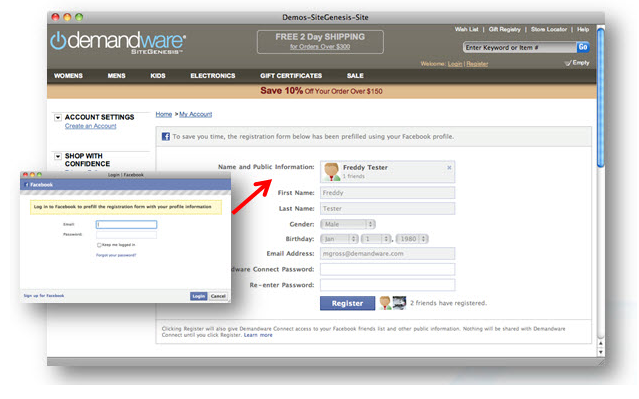 Facebook Connect allows retailers to simplify this process by making it easy for the shopper to join the site via one click using their Facebook credentials. A shopper who is a Facebook user (and chances are they probably are among the 500 million users) who visits your site is more likely to register on your site than if they were not a Facebook user. In fact, according to Facebook, sites that use Facebook Connect have seen increases of 30% to 200% in site registrations. In addition, when they return to your site, they’ll be able to authenticate using their Facebook credentials without having to remember a separate, site-specific credentials. Another important goal of retailers is to increase the amount of time users spend on site, as well as how much they share about the company’s products and brand off-site. When shoppers use Facebook Connect on a retailers site, they grant permissions for the site to post to their wall on Facebook, including easily share products, reviews of products and purchases made. Facebook says sites that use Facebook Connect have seen a 15% to 100% increase in the number of reviews and other user-generated content on the site. Creating a more personalized, “virtual word of mouth” shopping experience is another important goal of retailers. Since Facebook Connect accesses a shopper’s profile data, retailer’s are better able to personalize the shopping experience. Birthday information, shopping list, interests, and preferences of both the shopper and his or her social graph can be used to serve up products that better match the shopper’s preferences. Perhaps the best example out there is Amazon, which let’s you see what’s popular amongst your friends who’ve shopped on Facebook, and suggests gift and birthday ideas for friends in your Facebook social graph. Amazon also serves up product suggestions (music, books) based on your interests in Facebook. One of the main challenges with personalization with Facebook Connect is that you need a large number of people in your Facebook network to take action on the sites you shop in order to gain the benefits of Facebook Connect. If none of your friends take action, then the social intelligence Facebook Connect provides is rendered useless. While Facebook Connect represents a means for retailers to reach a the large Facebook user base, retailers should approach it as one option among existing capabilities around site registration and authentication, contextual social sharing and personalization. Connect should work in-line with the investment you’ve made in these areas, and not be viewed as an alternative. As Facebook activity across the web grows, particularly on ecommerce sites, Connect will increase in value to both shoppers and retailers. Until that time, pursue Connect as part of your strategy, and invest more as consumer adoption and activity increases.